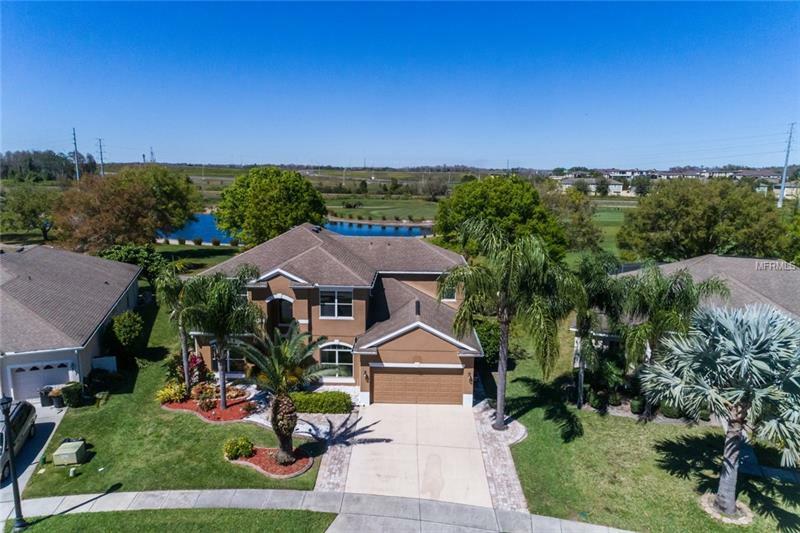 Welcome to Golf Front living with Pond Views and breathtaking sunsets! This 2-story Ryland Chadwick Model boasts 3556 SF 4 Beds 4 Full Baths Dedicated Office 2 Car Garage HUGE upstairs THEATER ROOM Private Screened Salt Pool with Covered Lanai all on nearly on quarter of an acre. This open split floor plan has always been one of the most desirable with tremendous natural lights and the Master Suite downstairs along with the Dedicated office. Unique upgrades throughout with beautiful 42-inch kitchen cabinets granite counters travertine floors stone stair railing and more. Upstairs you have 3 Bedrooms 2 Full Baths a Loft area and a THEATER ROOM. Overlooking the #4 fairway and beautiful greenspace never gets old! This community offers a premier location with its proximity to Orlandoâs International Airport Medical City 417 and 528 highways easy access to the parks and beaches and so much more. All A-rates area schools and community amenities including fitness pool baseball basketball tennis golf fishing pier and more! Donât miss out on this opportunity!